In this episode, I interview Nicholas Kusmich, author of Give: The Ultimate Guide to Using Facebook Advertising to Generate More Leads, More Clients, and Massive ROI. He also heads up the H2H Media Group, where he consults and manages accounts for high-profile speakers and authors. Nicholas shares how the four M’s can help you plan your Facebook ad strategy. You’ll discover the three key elements every Facebook ad needs. Facebook Ads Strategy: How Marketers Can Win With Facebook featuring insights from Nicholas Kusmich on the Social Media Marketing Podcast. Nicholas got into Facebook ads almost by accident. He had been marketing his products on the Internet without any success, even though he followed what everyone said to do: Create a course or ebook, and get paid traffic to sell it. His next step was to try Google ads, but then Google had another algorithm adjustment. Fortunately, around that time, two websites’ ad platforms were being released in beta: Plenty of Fish (the dating site) and Facebook. Nicholas jumped in to advertise his products on both and soon realized Facebook was going in a very aggressive direction. He was in the right place at the right time. Nicholas learned about Facebook advertising very quickly and got the advantage of being an early adopter. This was about five years ago. These days, Nicholas runs his marketing business with two key services. His boutique agency serves clients in a fully managed scenario. Nicholas now runs a business that fully manages marketing for clients or trains them to market themselves. His business also offers marketing training and consulting for business owners and entrepreneurs who want to implement their marketing for themselves. Listen to the show to hear what Facebook ads were like in the early days. Nicholas loves the paradox of Facebook’s size. On one hand, Facebook is an enormous platform: around two billion users log in for at least a few minutes each day. Therefore, regardless of your type of business or message, your prospects are probably using Facebook. Moreover, you don’t need a 30-second spot on the Super Bowl to reach hundreds of millions of people. With Facebook, you can do that with a few clicks of a button. On the other hand, Facebook allows advertisers to zero in on a small, specific audience because Facebook aggregates data. Facebook notes where people check in, what they like, whom they follow, and what they mention. And it makes that kind of information available to advertisers. So, for instance, if Nicholas wanted to target a Beverly Hills housewife who lives on a particular street based on her zip code, and who shops at Whole Foods, has an Amex card, and spent money on it in the last seven days or so, he could. Facebook’s targeting features are robust. This capability makes Facebook an interesting platform for an advertiser (a business owner or entrepreneur) who has a message, product, or service and who knows the audience they’re trying to reach. Facebook allows people to advertise at far lower cost than traditional advertising. So in the grand scheme of marketing, Nicholas believes Facebook advertising is the best direct-response platform and distribution channel to get a message to your ideal prospects. Listen to the show to discover the joke at Nicholas’ office. A lot of people focus on the tactics, such as how much to bid for the ad or what objective to use. Those are legitimate concerns, but Nicholas doesn’t think they’re the big needle-movers. When you put together any Facebook strategy, Nicholas recommends focusing on the four M’s: message, market, magnet, and mechanism. Nicholas recommends focusing on the four M’s: message, market, magnet, and mechanism. 1. Message. It all starts with the message. Social media is a noisy world. If you’re saying the same thing as everyone else, there’s a high probability that you’ll be ignored. Therefore, what you say is less important than how you say it. David Ogilvy, one of the fathers of advertising, said that people can enter into a marketplace in one of three ways: the promise, premise, or pinnacle. First is the promise, which is a how-to statement. For example, if Nicholas was a weight-loss coach, the promise would be something like, “Let me show you how to lose 10 lbs in the next 10 days.” Although that statement may be necessary, everybody in the weight-loss space is saying a version of that. You’re competing at a massive level, hoping your message will stand out. The second way to enter the marketplace is through your premise for positioning, whether it’s how you’re perceived or the angle you take. When you “zag” while everyone else “zigs,” it’s a positioning play that helps you stand out a bit more. Plus, it’s better to enter the marketplace with more than just your promise. The third is the pinnacle, which Ogilvy called “the Big Idea” and which Nicholas (who borrows a Jay Abraham term) refers to as “the Preeminent Idea.” This is how you stand out in the marketplace. It’s a concept your industry can grab onto, an uncontested space. Seth Godin might call the pinnacle your Purple Cow. Nicholas stresses that stories and narratives drive our economy, especially on social platforms. Rather than tell people to buy your product or service because it’s cool, talk about it in a way that’s unique and tells a story about the concept, and thus might create a connection. Nicholas believes that connection is the core transactional value that exists in the world today. People transact based on how much they connect and resonate with an individual. Give: The Ultimate Guide to Using Facebook Advertising to Generate More Leads, More Clients, and Massive ROI by Nicholas Kusmich. I ask Nicholas how people articulate their message in a differentiated way, and he says his book explains how to a certain degree. He also thinks good copywriting is “more caught than taught.” Surround yourself with unique ideas and you’ll start to realize that different people say certain things in certain ways. The more you do that, the more those skills start sinking in. A simple copy formula Nicholas’ company uses in almost all of their ads is called the Feel Felt Found copy template. Tell people, “Hey, I know how you feel. I felt the same way too, until I found whatever.” That leads you to introduce your offer. Even if you don’t use those words exactly but you write the copy with authentic empathy, you’re on the right track. Nicholas often says, “A good message isn’t when your ideal prospect understands you. A good message is when your ideal prospect feels understood by you.” The more you can convey messages that do that, the better off you’ll be. 2. Market. In the early 1900s, Italian economist Vilfredo Pareto developed the Pareto Principle (the 80/20 rule), which is applied to all sorts of things, including understanding your market. For instance, if 100% represents everybody out there, you want to find the 20% who you really want to talk to. In today’s noisy marketplace, Nicholas believes the 20% is too broad, so his Kusmich Principle says to home in on the 4% of people your message is for (4% is 20% of the 20%.) That group doesn’t have to be the only group of customers you ever talk to. However, if your ads, communications, and content speak directly to a certain segment of your marketplace, you’ll be better off. It’s micro-marketing versus mass marketing, Nicholas continues. Remember, Facebook’s incredible amount of data enables you to micro-target your ideal customers. To find them, use what Nicholas calls the Targeting Trifecta. It’s the three F’s. Use follow, frequent and fund as a guide to your targeting. The first F stands for “Who does my 4% follow?” Facebook is made up of different tribes and every tribe has a leader. So if you’re in the personal development space, you could build your own tribe, or see who’s a tribal leader (influencer) in that area, such as Tony Robbins. Then use Facebook to target the fans of that influencer. The next F is “What do they frequent?” Are there certain publications that your 4% are reading on a regular basis, such as SUCCESS Magazine, Entrepreneur, or Better Homes & Gardens? What someone frequents on a regular basis tells you a lot about them. That’s another way to target people with Facebook ads. The third F is “What do they fund?” Where someone spends money is likely where their hearts, passions, and interests lie, and it tells you a lot about that individual. If you know that someone is potentially spending money at Whole Foods, for example, it tells you that they might be health-conscious, they probably have some discretionary income, and other things. When you think about how to reach your 4%, take a sheet of paper and make three columns: Follow, Frequent, and Fund. Then come up with an exhaustive list. 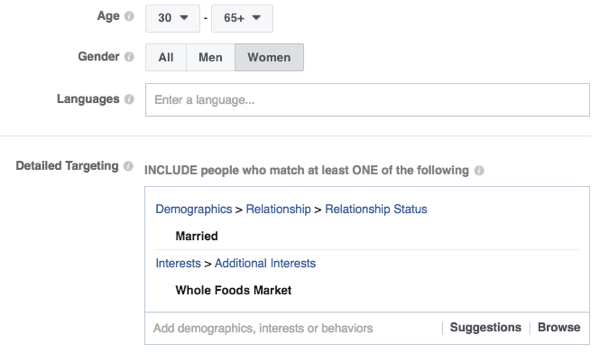 The next time you go after Facebook ads, you won’t have to think about whom you should target because that list will point you in the right direction. I ask about remarketing, and Nicholas says it’s both different and the same. First of all, your retargeting pixel should be on every web property you own: your sales page, your add-to-cart page, every content page, every blog page, and every funnel page. People who have already interacted with your website are your warmest audience. Facebook allows you to choose how long or how big an audience you want to target. You can remarket to people who visited your website in the last 180 days or the last 14 days. However, Nicholas stresses that 180 days is a long time to see the same offer. Switching up your offers over time is typically a more effective remarketing strategy. 3. Magnet. A magnet is something you give in exchange for an email address to build your platform. Figure out what you can provide in your marketplace that has an enormous amount of value and thus will earn you the right to ask for some sort of interaction. Nicholas says marketing on the Internet has two golden rules. First, you must give before you ask. (Some people misinterpret that to say, “Give before you take.”) Second, every step of the marketing process should be valuable in and of itself. So even if someone never transacts with you, you want them to walk away from the marketing experience feeling they learned something new and it was beneficial. That being said, a magnet is anything you can share that provides value. Even this AMA qualifies as a magnet because viewers can get an answer to any question without any obligation. If your magnet leads to the exchange of an email address so you can bring someone into your world and nurture that relationship, all the better. Nicholas suggests a framework for creating a magnet. His framework follows the acronym SAGE. S stands for short. In today’s digital world, nobody has three hours to consume your content. Instead, give them something they can consume in four to seven minutes. That time frame is enough for your potential customer to dip a toe in the water and decide whether they want to engage with you further. A stands for actionable or action-oriented. Content is abundant. So instead of information, lead with insight. Insight is what to do with information to get a specific result. For example, Nicholas gives away an ad-writing template. Over the years, his company has learned how to write good ads, and in that process found that every ad typically has 10 elements. Rather than offer a 20-minute piece on how to write good ads, his company put together a simple, step-by-step template that helps people apply the information to get an actionable result. Help someone make progress, they will be delighted, associate that progress with you, and naturally come back for more. E stands for easy. Everyone tends to complicate everything. People are looking for easy solutions. To test whether a lead magnet is easy enough, Nicholas asks himself whether an eight-year-old would understand it and potentially apply it to their business or life. 4. Mechanism. Mechanism is the process you use to find a prospect, bring them into your system, and turn them into a customer or client (a sales funnel or sales process). Determine what you can do and offer over a certain period of time to turn someone into a client or customer. Nicholas shares a stat that 50% of everyone who inquires about something ends up buying it within 18 months. But it doesn’t mean they’ll buy it from you. Only 15% of that 50% will buy within the first 90 days. Everybody else will buy after that. Based on this stat, businesses are leaving behind a lot of potential customers. For the most part, marketers are really focused turning someone into a lead and then turning them into a customer or client right away. Although marketers are serving that segment of the industry really well, people are still leaving a ton of potential business (85%) on the table. Nicholas says that your mechanism is all about the long game. Figure out what you can put in place that nurtures people over time and gets them to know, like, and trust you. Then when they’re ready, on their terms, they’ll enter into a transactional relationship with you. Listen to the show to hear about using assumption testing to better understand customers and prospects. Use the three C’s to influence viewers. In this formula, the three C’s stand for click, capture, and convert. To prompt people to click, your ad needs to stand out and capture users’ attention enough so they click through to the page. To get a click, Nicholas continues, every ad needs three key elements: look, hook, and took. Look. Look stands for the image. The success of any Facebook ad boils down to a good image. You need an image that stops a user in their tracks, but that also makes sense and aligns with your brand. After your image captures someone’s attention, they’ll read the rest of your copy. To make your image stand out in the Facebook feed, for example, make the image grayscale, black and white, or even upside down. If everybody is seeing colored image after colored image, and all of a sudden they see a black-and-white image, that’s enough to make them stop. Nicholas says you hear that the best place to hide a tree is in a forest. That’s true if you want to blend in. However, if you want to stand out, find creative ways to do that. Just don’t overdo it. And take it easy on the big red borders or arrows. That screams “marketer” and often gets ignored. Hook. The hook is about creating a connection. When somebody is on Facebook, they aren’t looking to buy anything. They’re looking to connect with someone or something. If your ad copy can build some rapport (the Feel, Felt, Found formula), that’s a great start and may convince someone to take a little step further with you. This ad successfully executes on the look, hook, and took framework. I ask Nicholas how he feels about the character constraint before the See More button. Nicholas says he’s a fan of long-form copy because he doesn’t want his copy to feel like an ad. He wants it to feel like a social share. At the same time, he wants to create a good user experience. Therefore, he likes to push the boundaries and write as much copy as he can before the See More button appears. Took. Took is the action you want the person to take. Nicholas says he learned the hard way about the need to spell out the action users should take. In some of his earlier ads, he wrote ad copy and offered a lead magnet. He remembers the first comment saying, “Great. Yes, I want it. How do I get it?” The person didn’t realize all they had to do was click the ad, go to the landing page, and fill out their name and email. Now, Nicholas puts a very clear call to action in all of his ads. For instance, “Click here to register to get your free downloadable PDF.” Or “Click here to watch your video.” After this call to action, Nicholas recommends putting a hyperlink in the ad copy. People see a URL underlined in blue and like to click it. This URL has increased the click-through rate of the ads Nicholas runs by 30% or more. Listen to the show to find out how much white space to use in your ads. The Ecamm Live software stands out by making these powerful features easy to use. You find some of the same features that Wirecast or OBS offer, but the Ecamm Live interface uses drag-and-drop technology. The ability to go live and show your desktop and thumbnail are some of the great features of Ecamm Live. While you’re live, the Ecamm Live interface looks and feels like the Facebook Live interface on a mobile device. See the comments and reactions pop up so you can engage with your live audience. To test-drive Ecamm Live, you can download the free trial, and the one-time cost is only $29.99 (much more affordable than $495 for Wirecast 7). You’ll like how Ecamm Live allows you to be creative and not get too caught up in the tech. Listen to the show to learn more and let us know how Ecamm Live works for you. What do you think? What are your thoughts on Facebook ads strategy? Please leave your comments below.